Love this scarf story, in part because it is a young lady I know and love, but also because it shares something that happens more often than some may realize: God gives a word that is for a later moment. Sometimes God wants to say something “before” so later – whenever that may be, you know He was there all along (which we know in our heads, but confirmation is always lovely). She shares this testimony on her blog, Sincerely, Bri. You can find the whole post here S-E-A-L-E-D, but I’ve shared a portion below. On my thirteenth birthday, I was given a silk scarf by a friend. 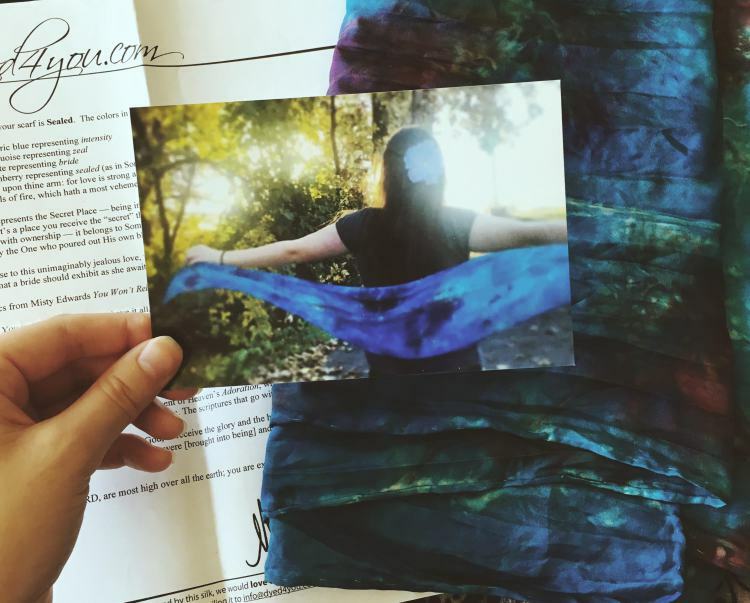 Not just any scarf, it was dyed by someone who makes prophetic art, silks, and flags. Everything they make is prayed over and has a spiritual definition. It’s really incredible! I have many silks now and each one of them has been profoundly meaningful. It’s so wonderful to have them as beautiful visual reminders of my walk with God. They are some of my greatest treasures. This particular silk is called Sealed. This silk represents the Secret Place –being in the shadow of the palm of His hand, a place of deep intimacy. It’s a place you recieve the “secret” things: mysteries and revelation. When something is sealed, it is marked with ownership — it belongs to Someone, it has been claimed. Just as our hearts have been claimed by the One who poured out His own blood as the seal upon our hearts. As a thirteen-year-old, I did not understand it. It didn’t resonate with me as I thought it should have. I was missing something. I haven’t thought about the scarf or the meaning behind it in a really long time, to be honest. But these last few days thinking about those six years, and then seeing that scripture randomly, I finally understand. I’ve found that the gift represented a place that Yahweh would take me, not a place that I had already been. When I was a child I always believed in God. I went to Sunday school, listened to my parents read the Bible, accepted Jesus into my heart, all of those wonderful things. However, not until I was a teenager did my relationship with God really start to deepen. In these years I have learned how to truly seek Him. Receiving that silk marked the beginning of my spiritual journey and discovering my true identity. I didn’t understand it when people went on about their exciting relationship with God. I hadn’t felt all that fire and the passion in my own life. But if there’s anything I’ve learned about relationships it’s that you actually have to put something into it. You can’t just expect it to happen on its own. You have to be committed. Yahweh wants all of my heart. Not just the bits and pieces I decide to give Him. I feel as though a deeper relationship with God begins with an invitation: “Come be the fire inside of me.” We have to ask Him to take us deeper, we have to want it. He doesn’t force Himself on us, He gives us a choice. Once you make that choice to completely surrender your life to Him, He is relentless in pursuit of your heart, and he won’t stop until He has every part of it. How amazing is it that the Creator of the universe wants to have a personal relationship with each and every one of us? He knows our thoughts and the number of hairs on our heads. He has seen our bruises and scars, and all the ugly parts and still, He wants us. I’ve come to know such an amazing love. A love as strong as death itself. A love that burns like wildfire, so deep that many waters cannot quench it. The love of Yahweh. He has held me in the palm of His hand, in this beautiful, secret place. He has taught me how to love Him, to love others, and to love myself. He has shown me that my identity is found in Him and nothing else. I belong to Him. 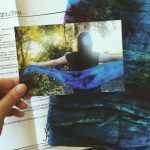 This entry was posted in Scarf Stories and tagged confirmation, encouragement, scarf on 19 August 2018 by Dyed4you (Meghan).